Home Life Style Unique Wow, this woman makes a face like a cartoon character! Wow, this woman makes a face like a cartoon character! Lianne Moseley has a unique way to show his talent as a make up artist. On the sidelines of his activities as bridal makeup, Lianne also like to paint the face resembles a three-dimensional cartoon character. Lianne, 25, said that his love of comics started since childhood. As a child coming home from school, she would usually spend time with sitting for hours sketching Sailor Moon. Passion was kept sharpened to grow up and now he became a makeup artist. Instead of spending the time to learn, while still in high school, Lianne prefer to dress her and train her makeup skills. And even though he had put on makeup for more than two years, his love of drawing cartoon characters in new faces practiced lately. "When I first did it, I then posted it on my Facebook account, and my friends love it," he said. Each comic transformation takes about a few hours to complete. 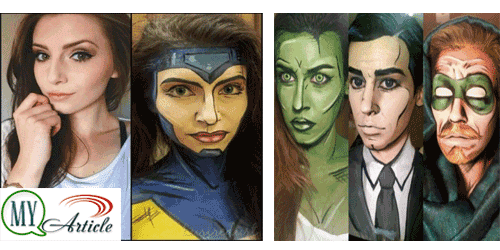 So far, the transformation favorite is when she painted her face resembles Captain Planet. "All of the popularity that I get because my brother. He was posting my work on Reddit," said Lianne. Lianne biggest dream is to work in the film world. But for now, he had been satisfied only with cosplay. You can see the amazing works Lianne on her Facebook and Instagram.